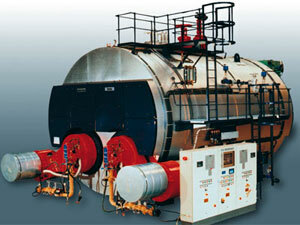 The Twin Furnace Thermax steam boiler range is ideally suited for large load applications. The range can be equipped with superheaters to produce very high quality process steam, or economisers to recover heat from the flue gas. Simultaneous or independent firing of the furnaces ensures maximum flexibility and turndown performance. The Thermax Twin Furnace steam boiler range is suitable for a wide range of applications, including CHP, airports and manufacturing. 10.34 Bar and 17.2 Bar, with designs available up to 25 Bar. Contact Cochran for information on capacities over 32000kg/hr.